Faced with bombs, assassins and old ghosts, Joel and Kieran must find out why they’re targets, who is after them and—most of all—how each would feel if he lost the other. Can they continue as best friends, or is it time to take a leap of faith? Full of adventure and suspense, this friends-to-lover story had me enthralled from the first explosion. As the first book in a new series, this story introduces readers to FireWorks Security and the highly skilled men who work for the company. In this first book, explosions, chase scenes, and drug wars make this an exciting read. The spark between long term partners, Kieran and Joel, develops into a special romance between two battle-hardened men. M/M romantic suspense is a genre full of brilliant series and unforgettable characters. Kieran and Joel aren’t as unique, quirky, or funny as some of my favourite men in similar series but I enjoyed their romance and I loved the action in this story. There are several interesting men introduced in this book and I will definitely be looking out for the next story in the series. JACKIE KESWICK was born behind the Iron Curtain with itchy feet, a bent for rocks, and a recurrent dream of stepping off a bus in the middle of nowhere to go home. She’s worked in a hospital and as the only girl with fifty-two men on an oil rig, spent a winter in Moscow and a summer in Iceland, and finally settled in the country of her dreams with her dream team: a husband, a cat, a tandem, a hammer, and a laptop. When she’s not working or writing, she… doesn’t exercise. Instead, she cooks and researches English history and traditional English recipes. She has a thing for green eyes, suede, and tight cyclists’ butts, and is a great believer in making up soundtracks for anything and everything, including her characters and the cat. And she still hasn’t found the place where the bus stops. For questions and comments, not restricted to green eyes, bus stops, or recipes for traditional English food, you can find Jackie Keswick in all the usual places. 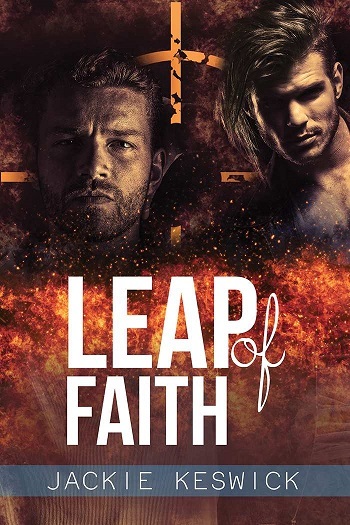 Reviewers on the Wicked Reads Review Team were provided a free copy of Leap of Faith (FireWorks Security #1) by Jackie Keswick to read and review.